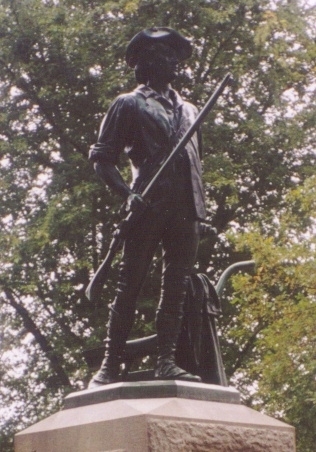 For approximately seventy-three unfortunate British soldiers, that shot and many that followed would take their lives on that day, the first day of the American Revolution. Fifty Americans as well would lose their lives or be mortally wounded on the ever memorable April 19, 1775. 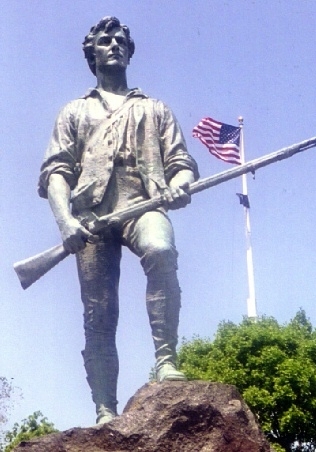 This site is dedicated to the memory of these men, whether they fought "to keep the past upon its throne" or were "nobly [daring] to be free." Here you will find the names and burial or memorial sites of the American and British soldiers and civilians who were killed or mortally wounded on that "glorious morning for America." If you click on a name, you will be taken to that person's listing at the Find a Grave website, a wonderful historical and genealogical resource. Each listing there includes more information on each man, as well as a photograph of his grave or memorial site, many of which I took myself. Also on this site you will find the burial or memorial sites of other personalities involved in the day's events, but who lived to tell the tale; a list of artifacts from the day that are currently on display at various Middlesex County area museums, libraries and historic homes; and a page dedicated to the four Massachusetts volunteers who were the first to fall in the Civil War in 1861, also on April 19.